There are major flaws of most MMOs, related to their fundamental elements. Levelling produces level-separation, so you can’t play with your friends. Specialisation, necessary to fill the tank-healer-dps roles, fixes players into repetitive gameplay. The fantasy genre demands certain over-familiar storylines. 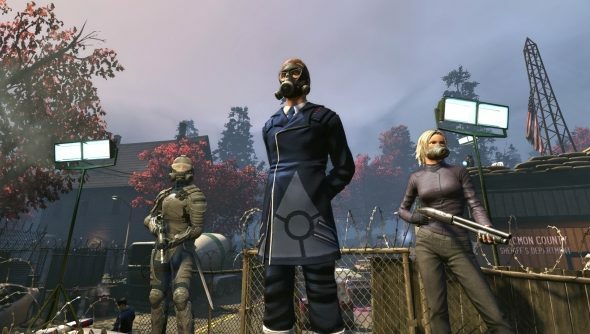 The Secret World, thankfully, attempts to fix all of those problems. It doesn’t fix every problem, mind. Factions do something similar to levelling, splitting you off from the people you want to play with and hiding part of the story from you. Multiple servers are endlessly confusing and tedious, then swiftly lose populations after launch. They’re still going for a subscription model, in face of the trend towards free-to-play. Sadly, Funcom hasn’t done away with these. Yet in terms of specialisation, level-separation and genre, the Secret World has moved in the right direction. The game is set in the modern world, but the story takes place beneath the surface we see, with a strong linear storyline that players of all three factions experience from different angles. An event happens in the Orochi corporation’s headquarters in Tokyo that parallels the awakening of super-powered humans around the world. Your player is one of those humans, recruited in the weeks after the event. Each secret society faction has a unique introduction storyline set in the streets of London, Seoul or New York. It’s joyously X-Files-y and portentous, pulling in conspiracy theories and secret histories from all backgrounds; for example, the Templars are dedicated to delivering the world from evil using their raw power and righteousness. The Illuminati, on the other hand, are Machiavellian, selfish and exploitative. The Dragon finally, are mysterious and chaotic. All put little value on your life. The actual gameplay is relatively simple, but the levelling is complex. Funcom has gone for the Planetside model of mix-and-match skills, which results in players who (once they’ve completed the tutorial) are mostly useful in all scenarios – you can certainly play together, no matter what level you are. The combat – hotkeys controlling a limited number of possible actions – is familiar from Guild Wars and is only leavened by the use of modern gunsalongside magic and swords. The skills allow players to specialise more and more deeply, but as you’re limited to two weapons / magicks at any one time, it encourages you to specialise at first – the longer you play, the more flexible you become. As you can set up pre-made builds of unlocked skills to swap between on hotkeys, much like Rift, it means players can switch play styles as needed – troublesome in PvP but useful in dungeon-diving. The design of the areas we’ve had hands-on with is impressive too. From the opulent design of the starting areas (which are dialogue-heavy and endlessly charismatic) to the bizarre hollow centre of the world to the varied quest areas, the game is versatile and varied. So far, we’ve seen an Innsmouth pastiche, a nicely-observed chunk of Egypt (complete with a beseieged modern town and intact temple complexs appearing from the sands), a lump of ancient America packed with Vikings, Mayans and Native Americans, and the end-game in wampyr-packed Transylvania. Even the dungeons are nicely variable, as you chase down the origins of the endlessly-corrupting Filth that’s infesting the world. On the other hand, and demonstrating their ability to draw inspiration from any other game, crafting is taken from Minecraft and Diablo 3. While crafting, players can disassemble items to make more basic materials, combine these into better quality elements, and place them into particular shapes to make particular items. It means that, even if you pick-up an item that’s has the wrong stats or isn’t high enough level, you can dismantle it and rebuild it with other bought or found materials to make something that fits your needs. Funcom has tried its damnedest to fix the MMO, whilst changing up the most familiar, boring elements. Yet, like most MMOs, we know how it plays and what the setting is like; it’s just left to the launch to see if it attracts enough players to let us see all its secrets.